Dale is not much for computers but since he started reading what I write about all this, we go to the coffee shop to update the blog and check email and before I even get to it he is asking what the comments are for the day or who we have email from. I always make sure I show him email from Earl – a good laugh is wonderful medicine and you send some of the best jokes! A good laugh also helps when a person is on a steroid roller coaster! We have told the kids to not even try to come this weekend if the weather looks bad and that will make for a very long weekend but we’d rather have that than worry about them on the road. I hear that our Christmas decorations are going up and that things like Chicken and Rice Casserole are being cooked (thanks to help from BJ) – I can’t wait to see everything when we get home. Thanks son for filling in for us and going to your sister’s band concert! Dale’s labs showed the potassium was back down a bit. we went to the Farmers Market today just for something to do. It was pretty chilly but the sun is out and it seems warmer. This entry was posted in Faith, health, Kidney, Personal on December 13, 2007 by Dee. I’m enjoying the pictures. Dale, you are looking better and better. Keep up the good work. Dee need a picture of you also. Everything sounds so much better. Thinking and missing you. Dee, go to the Mozzarella Company. It is down by where you are in Deep Ellum. Good cheese especially their Christmas cheese. Dale can eat these now or will be able to soon won’t he? Hey Brother and Sister! You guys are going through the hoops! Kudos to you!!!!! We have you in our thoughts and prayers. Your kids have stepped up. Isn’t it wonderful to know that they have what it takes? You don’t know how happy we are that things are going forward. Life is such a wonder. We wonder; how in the heck do we get through these things. After our accident we were working so hard to survive and now we are going on and on and on. Like the bunny. It is amazing. Dale, you look so good. 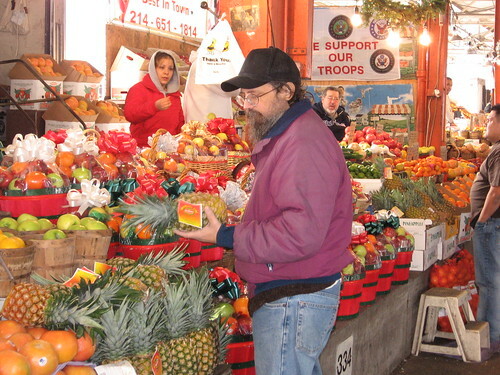 I would love to go through the market with you and check out the good stuff. The only thing I could eat for a while was squash—yes squash. And I got to know them all. Good for digestion. haha. We also got into candles. It was so funny to see Dennis in a halo and me in the “chair” sniffing candles in the grocery. Have a great weekend! Stay warm and dry during this cold snap. Keep posting the updates and pictures; it’s great to see Dale out and about. Just checkin in and it’s great to see things are going well! Sounds like you have a great support thing!